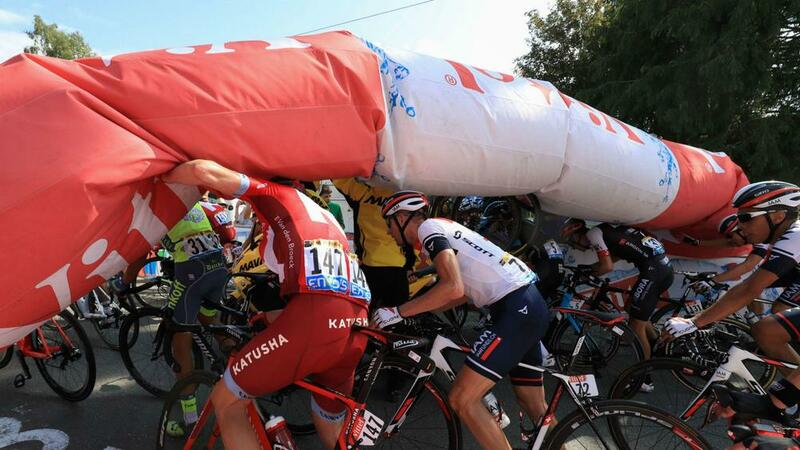 There were chaotic and comical scenes towards the end of stage seven of the Tour de France on Friday when the inflatable flamme rouge collapsed as a group of general classification contenders neared the finish line. The blow-up structure serves as a marker to indicate that there is one kilometre remaining, but several riders were affected by its deflation towards the end of the 162.5-kilometre ride from L'Isle-Jourdain to Lac de Payolle. Runaway victor Steve Cummings (Dimension Data) had already safely passed the marker and yellow jersey holder Greg van Avermaet (BMC Racing) was also unscathed. However, Orica-BikeExchange's Adam Yates was one of the first to reach the scene and was left with a cut to his chin, although the team later Tweeted that the Briton was unharmed. Several riders were caught up in the carnage as race officials and spectators attempted to help clear the road. Until that point, the 2016 Tour had passed with relatively few incidents and there had been no abandonments in the first six stages for the first time in the race's history.